The modern part of Riga extends eastwards outside the moat and on the west bank of the Daugava river. Northeast of the moat lies the beautiful Esplanade park with the Nativity of Christ Russian Orthodox cathedral. Along Elizabetes street there are several Art Nouveau and Neoclassical buildings, erected towards the end of the 19th century and the beginning of the 20th century. 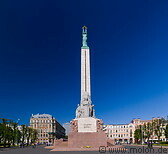 The Freedom monument is a tall column located in a square immediately east of the city moat. The Alfa shopping centre is the largest mall of Riga and is located a few km northeast of the city centre.